We train and compete in obedience, rally, agility, water, and conformation venues. Always owner handled, our dogs have titled in each of these areas of competition. (Syracuse Obedience and Training Center), located in Central New York. Recognized by the AKC as a Breeder of Merit since September 2013. In 2001, Cosmo with his stoic beauty, intelligence, and working drive, finished his AKC championship completely owner-handled, while simultaneously earning his Novice, Open, and Excellent agility titles. In 2000, the addition of a female puppy, “Minnow”, Watermark Sea Minnow CD RN AX AXJ WWD SROM, made our family complete. The fall of 2001, found us awed by water trial performances at the PWDCA National Specialty in Warwick Rhode Island. 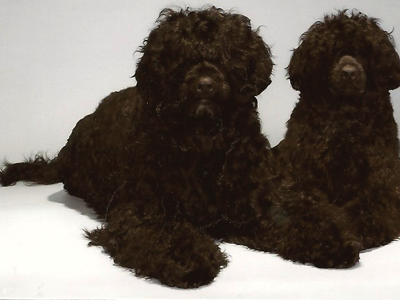 they made their debut in water, both earning Apprentice Water Dog titles at our first trial. One month later, at the 2002 PWDCA National Specialty in Lake Geneva, Wisconsin, they both earned their Working Water Dog titles. sense of pride in our dogs, and excitement for our future with them and the remarkable PWD breed.